What is Skipping Bail or Jumping Bail? After you pay a bail bond agent, you are free to walk about of jail however, you may still have some questions regarding the Bail Bond Process especially if this is your first time in this situation. Some questions you might have is “what do I do between now and my court date?” or “what is bail skipping or jumping bail?”. I will be answering those questions further into this article, so please take a few minutes and read! 1. What is Bail Jumping? Bail jumping is a term that refers to not showing up to your assigned court date. Another word that refers to the same is skipping bail. Jumping or skipping bail is illegal in ALL 50 states in the United States. Doing so will add more charges to your case and create a financial burden for your family and co-signer. 2. What happens if a defendant fails to appear in court? Failing to show up to your court date can result in various things that could happen. The bail bond agent will make arrangements to reschedule your court date so that you can show up. Also, the bail bond company will hire bail recovery agents to find the defendant and bring him back to court. 3. Skipping Bail is illegal. Skipping bail is illegal. A defendant that fails to appear in court will have a warrant for their arrest as well as face additional charges for skipping bail. For example, if you have misdemeanor charges, you could get a felony and if you already have felony charges you can get more felonies added on. If you are on probation or parole, you violate your probation or parole by skipping bail. Any security or collateral taken will also be forfeited so all in all it is not worth it. 4. Skipping bail can have consequences. Skipping bail can have a variety of consequences. As mentioned above, you could face additional charges for failing to appear in court. 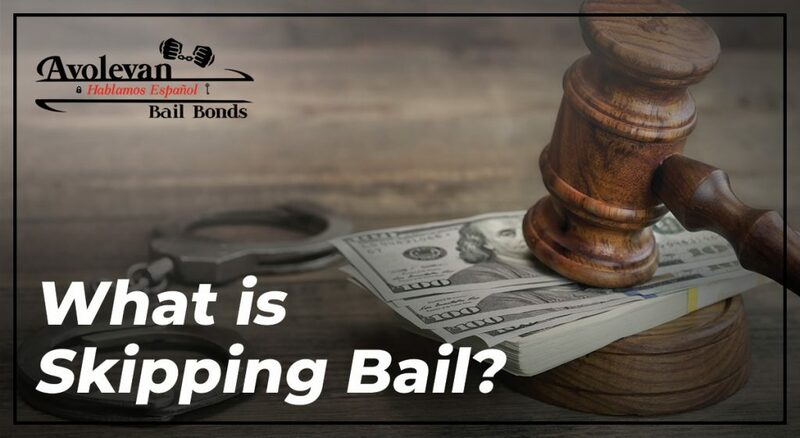 If you put up any form of collateral or security against the bond, it will be forfeited when you skip bail. Skipping bail can also affect your legal status, your family’s finances, or your ability to negotiate a good plea deal. When you sign the Bail Bond Agreement, you sign saying you authorize all this to happen in case the defendant does not show up in court. Skipping bail is never the solution. Jumping bail makes situations much worse then what they could be. You could face additional criminal charges, you could put your family or co-signers in a financial burden because of your selfish acts, and you could lose all your collateral. There is no point in skipping bail. Criminal charges can always be fought with determination and a good attorney. You should own up to your mistakes and learn from them, but running away from the mistakes will get you nowhere.